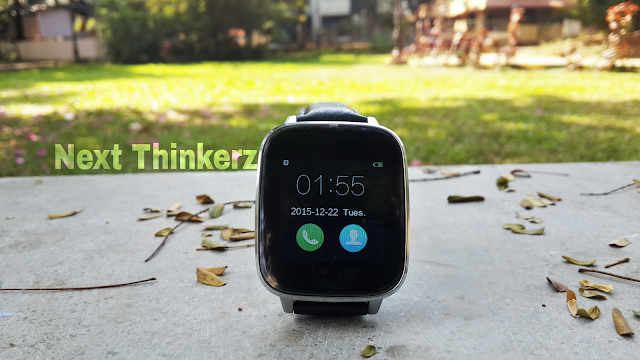 Wickedleak Alpha Smartwatch Review : 7 Things You Should Know. In the Pre-era of Digital Age, first emerged the PC(Personal Computer), then the laptop, followed by Smartphone & then joining the league as the 4th category was a Tablet, which essentially was a gamble between a laptop & a smartphone brought by Apple. It wouldn't be wrong to say that mostly, Apple was the pioneer in mobile Industry. Since then, Other Manufacturers are always trying things out just to find that "One more thing", which could give the respective company ample amount of sales. Put forth, Can there be a new category of devices? If yes, what would that be? Back in 2014, there was this notion around the world by media enthusiast's that "2014 was going to be the Year of Wearables" & there's no exception to that. Now in 2015 we can see hundreds, if not thousands of prototypes filling up the gap in the term of 'Wearable tech'. Major players like Microsoft, Google, Oculus, Samsung, Htc are really pushing things to the next level. Now if you're up to find the initial stages of this word : Wearable tech - Smartbands & Smartwatch's immediately strike your mind. Nike is a well known company for their product : Nike fuelband(Smartband). Then Pebble introduced the world, of what a smartwatch could be with their Pebble Watch. But back in the day smartwatches weren't actually considered as an category of smart devices, up until Google considered to jump in with 'Android Wear' grabbing a lot of attention. Even Apple joined the league shortly with Apple Watch running Watch OS. As soon as Android Wear was announced, many big companies hopped on-board with Google to create their own products. But shortly after a year now, Android Wear hasn't gained a considerable amount of Momentum. Sure there are many smartwatches made by various companies, but the actual sales are disappointing. If you consider the Apple Watch sales against the entire Android Wear ecosystem, Apple Watch has an edge here, which if you ask me is strikingly confusing. Part of the reason why few manufacturers are moving from Android Wear ecosystem & creating their own custom OS. Partly the reason might be that the manufacturer is not satisfied with the Google's OS or he/she is just up to find the, "One more thing?". Take a well known company like Samsung for eg. Recently they announced Gear S2, which runs on a Custom Tizen OS. While I'm quite impressed by the responsiveness of the Tizen OS running on Gear S2, as I got a chance to play with it. 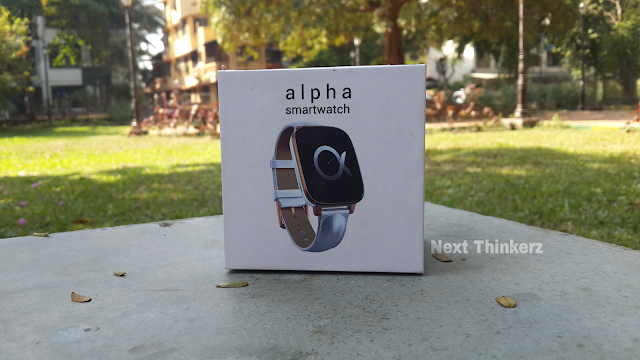 So the Alpha smartwatch is a combination of stainless steel & high quality textured smooth plastic on the body. While the glass upfront is curved panel, which gives it a more minimalistic appeal. While the glass display is Scratchproof, so no need to worry about minor accidental scuffs. That's basically the part of the main watch module. Now let's move towards the hottest topic - bands. The Alpha smartwatch at the moment has some gorgeous leather straps and so far have been worked fine for me. The bands can be switched without any hassle with a simple trigger mechanism, just in case if you need to match your fashion statements. Though I'm hoping there might be more bands one the way, especially metal/stainless steel bands. Put together, the square look of the watch doesn't make it look eccentric, which is cool because of the round edges and subtle curves found throughout the body. So that easily gets a pass for a convenience from me. Quick Note : for you people who foresee numbers, the bands are of 22mm size. While the watch is 10.9mm thick. It features a 1.5 inch curved 3D glass panel forming 250x250 of pixel resolution. The display is easy to read without any pixelation(when hold at a considerable distance), while the brightness can be toned up/down, depending upon personal preferences. Though the proximity sensor is not found, which is kind of a bummer. But the software on-board sums that up. Yes, the software! Simply dig down to Settings>Motion & turn on - Wake Up Gesture option. Now whenever you need to see the time without tapping the watch switch, simply perform the old school gesture & the screen will automatically turn on, while it'll go to sleep when you put your hand down. It runs on a Mediatek MTK2502 chipset. While there's no info about the RAM displayed either on Website or on the actual box. Apart from that, it sync's via a Bluetooth connection. As the watch has Bluetooth 4.0, which we'll talk in a bit. While it also has the usual set of sensors, which you would find on any other wearable device including a heart rate monitor, a barometer, pedometer, Altimeter & a temperature sensor. 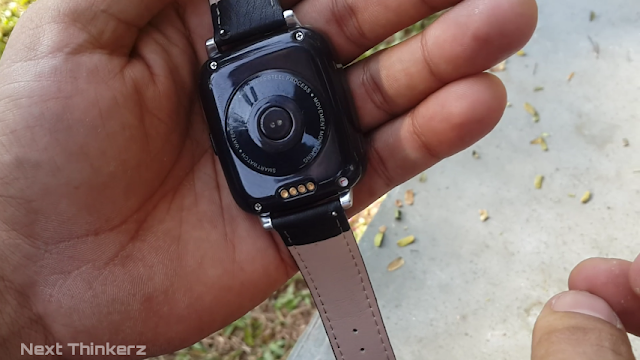 While as an added bonus Alpha watch is also Water Resistant & has a Speaker port on the left edge which is kind of interesting, As i don't think anyone would consider using it in class. As there's no silent switch in the software in-built on the watch. But that can be easily fixed via a software update. Alpha Smartwatch comes with a 280mAh Li-Polymer Battery, which actually seem very small. But that isn't a case, Infact i was surprised that this device gave me about 3days of battery backup until it ran out of the juice. 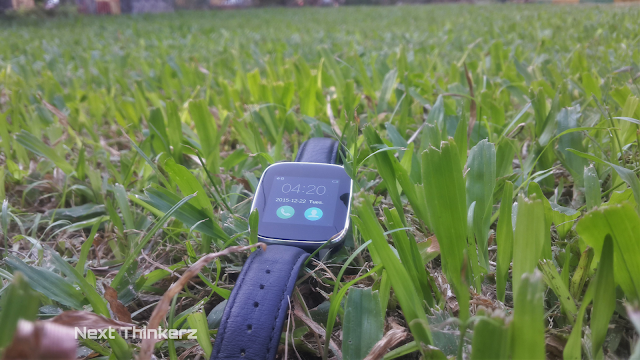 While the review treatment included the use of Pedometer, connection to Bluetooth half of the time & checking heartbeat every now and then. I'm guessing the custom OS is the real deal behind this. Trust me the custom OS might not seem great, but if it gets me the required 3days worth battery backup in a Single charge, I'm down with it! 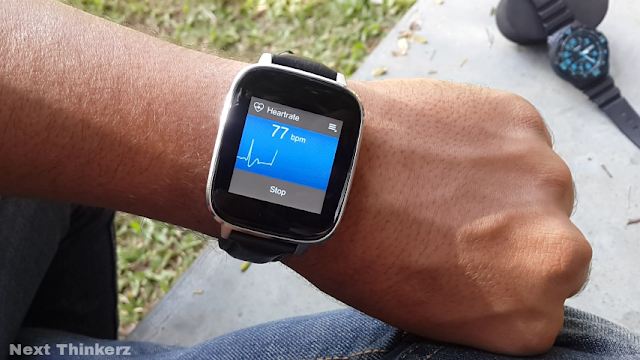 How Heart rate is measured from your wrist? Well let me break it down a bit for you. First of all, the heart rate sensor is present on the back of the watch which measures your heart rate by emitting green LED colours. This technique is termed as 'Photoplethysmography' though crazy as it sounds, it's not that hard to understand this term. Our blood is red in colour, because blood cells represent Red Colour & absorb Green Colour signals. 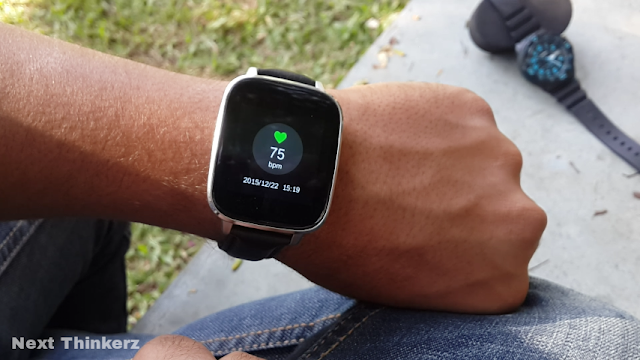 So Wearables emit green colour in sequence of multiple times, so that those signals are absorbed by our blood cells and then via blood flow, the Heart Beat Per Minute is calculated(BPM) by the Alpha Watch. I know, i know.. Boring... But if you want to know more, here's the link. Fun Fact : Ever wondered why our blood veins are green in color? Colour absorption is the answer. It runs on a custom software made specifically for this watch. If you dig down into settings & about section, it doesn't reveal any name of this OS in specific, apart from the combination of few numbers & alphabets. A new OS to test is always a treat to reviewer, the person gets to try something that he/she hasn't tried yet, isn't it? So after the initial setup process, my initial impressions about this watch were not so good. I didn't liked the OS at all, but then when i actually used it for about 4 days it obviously changed my mind. Tap the button on the right edge & the screen comes to life. Press & hold hard on the display to change watch faces. Once you're done changing the watch face suiting your taste, perform a right swipe gesture to reach the App drawer(4x4/1x1). There are various apps from calling, texting, taking photos, calender, sports activities, all the way upto enjoying music. So here's the list of what you can do with this watch, although Many of these actions need Bluetooth connection with your phone first. Answering up calls with a flick of the wrist. The inbuilt microphone is of decent quality, although the speaker output is tiny. 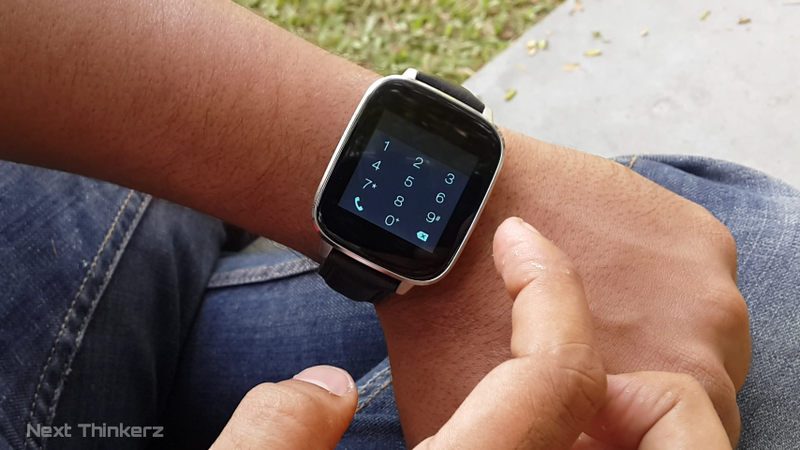 Everything from calls logs to messages are synced, while you can even place a call using the dailer app on the watch. Tilt the watch to scroll through the app drawer, which again can be accessed via settings. If you do the right swipe gesture twice in a row, you'll land in notification centre. Here you can find all the notifications from your Android/iOS device. Almost Every app displays push notifications on the watch panel, if you wish you can block per App notifications from the watch/app itself. Pedometer displays your Steps & Kcal burned during an activity. While during my test, I was quite impressed with the accurate readings to be honest. There's even a Sedentary reminder app that reminds you to have a walk depending upon the timer you've set. Similarly Sleep Monitor let's you know, how well you slept depending upon the time. While Remote capture let's you capture a photo, when it's snyced with your phone over bluetooth. This'll be handy in few group-fies. While rest of it's gimmicky features include Heart rate repeat app, where you can get a realtime overview over heart beats per minute. Apart from that there's stopwatch, calender, Bluetooth music, sound recorder, calculator(very handy) , Du-Voice & for some reason a file manager? Du-voice didn't worked on my unit, I'm guessing it might be something like Google Now, Siri. 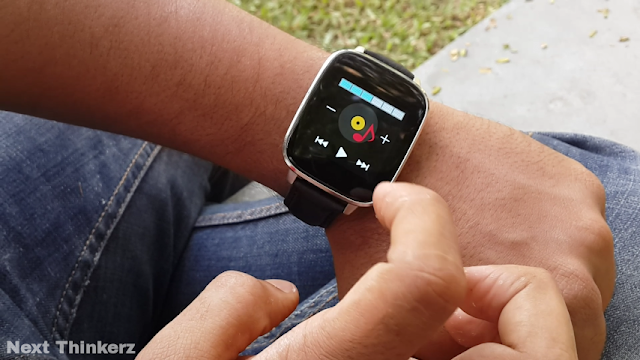 The Alpha Smartwatch is compatible with almost every Android/iOS device out there, since it simply requires a bluetooth connection. However if you need to gain access over it's entire features including in-app push notifications, then you'll require an Android Device running Android Kitkat 4.4(& above), while an iOS device running iOS8(& above). Setting up the watch is damn easy, simply scan the OR code from the retail box and you'll be prompted to Download/Install the App. Then turn on bluetooth & tap the watch icon on the App, that's it! Fun Fact : I was prompted to download an Apk, instead of installing it from Play store. Eventually I did find another way to install the App(Another vendor) via Playstore, which was via the Quick Response app from the watch itself. It is available in Gold/White and Silver/Black as a whole in combination. While you can buy it exclusively from Wickedleak's Website only. It was launched at a price of Rs.6,990, though now you can get one for about a price of Rs.5,990. Also their website does state an wicked after sales support, go check that out. Link to buy : Wickedleak Alpha Smartwatch. So is Alpha Smartwatch worth buying? Well, absolutely. 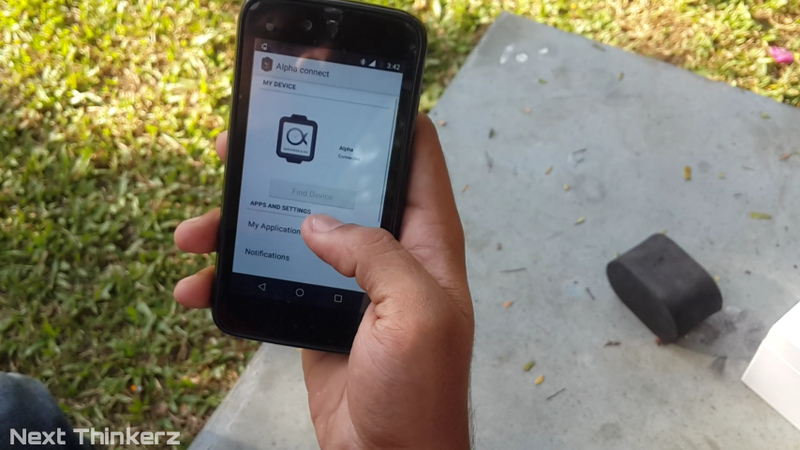 Don't get me wrong, it's good at performing key tasks like dismissing useless notifications, tracking your health activities, showing health diagnostics in realtime & working as a phone when you can't reach your pocket. All that running on a 280 mAh battery giving over 3 days of battery backup with moderate-heavy use, that's not something you can say about an Android wear device(especially the battery dept). Although the thing where it suffers is Apps, but if you ask me.. less is more. Though only thing I need to see on this watch is more customizations, which I'm hoping might be pushed via an OTA(which actually lies under the about section from the App). Although it would be cool to see that Alpha watch boot-logo as a watchface, anytime in future. So that's basically how this smartwatch can be phrased in a sentence!. Do let me know in the comments below, what you think about Wearable tech here in late 2015. 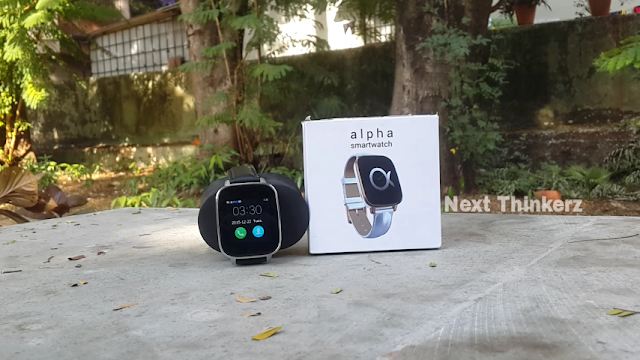 Before that quick shout-out to my buddy Rohit Koli for helping me out with his camera, make sure you subscribe to our channel : Alpha Smartwatch Video Review will be out soon. Also See : Wickedleak's Wammy Titan 5 review.